This day was the last day and if I only got to Monte Nerone (1512m), I would not mind being back by midnight again. 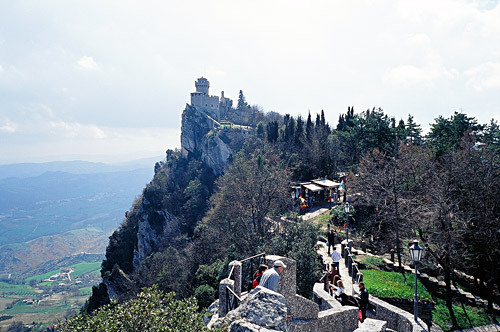 But I also was not going to miss visiting San Marino. Things started so good this day that I thought it was ominous and so it turned out to be. First I had my bicycle cleaned up at a car wash and felt fine. 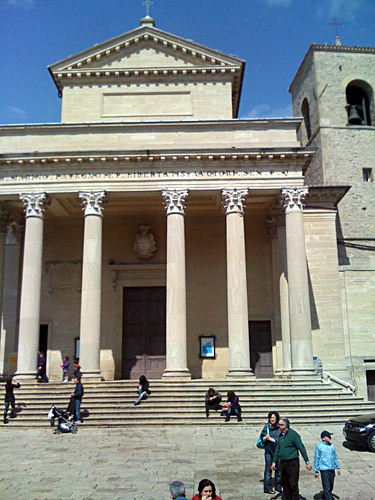 Then I passed by the bicycle shop where I had stopped to buy an inner tube on the day to Santuario della Verna. Here I got a new tube again and I asked about my broken spoke. They fixed the broken spoke very expertly (compared to at home) and it only took 10 minutes and they did a better job than I could imagine (as a Swede) for only 5 euros. 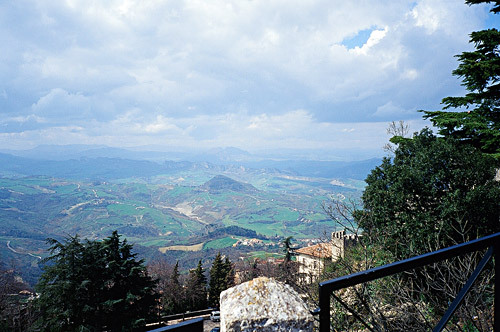 The sun was shining and I started on my way up to San Marino via Verucchio. I met some funny German cyclists after taking a wrong turn, who suggested I tried to get up on the road straight ahead (which they did not take themselves). They did not know what they were talking about, but I managed to find a way up to Verucchio this way too and this one was steep, with some loose gravel on the bad asphalt and over 20% I just managed to get up. In Verucchio I met the Germans again who came up from the other side. 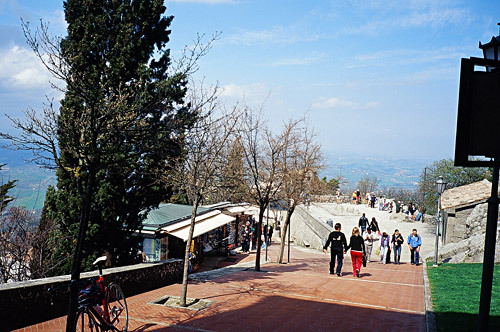 Then the winding road to San Marino (725m), which made me wonder for some time if I truly was on the right road. 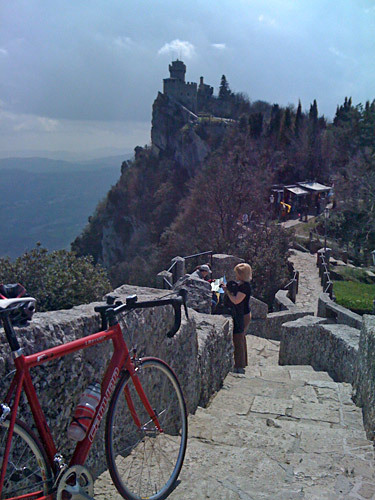 Just before reaching San Marino there was a sudden steep little ramp on the otherwise easy road. Just across the border, there were houses lining the roads everywhere. 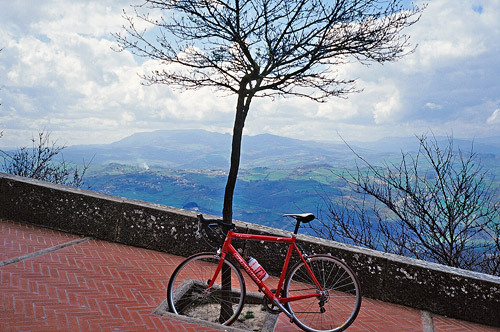 I found the way up the busy road to San Marino centre and from there improvised on the way up to the highest point reachable with a bicycle. I took the normal road as far as possible and then only had a short and steep stretch on the walking lanes up to the fortress on the top. It was a bit chilly, but the weather was mostly fine and I stopped for several photos around the place as it is truly very nice up here. I went down another way through more of the walking lanes in the old city centre. 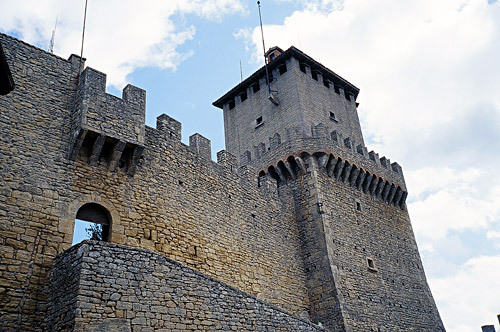 I then continued toward the other end of San Marino and stopped at a big supermarket where I got a good sandwich in the grocery and a coca-cola. Now the weather suddenly turned worse and there was rain in the air and it was quite chilly. 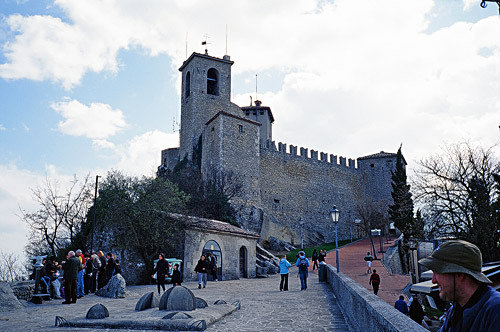 After trying to get a little warm, helping a lady getting a shopping cart and trying a false road, I eventually got out of San Marino and down to Mercatino Conca (275m). The rain did not continue and I went up the Valle del Conca and decided to take off on the first road going in the Monte Nerone direction. The road looked like a small and nice alternative to the road over Monte Cerignone, both while there and looking on the map. None of the roads had an official pass name, so that also did not matter. Was this a bad choice???? Yes, it was! Even though I actually met some cyclists and the road was fair up to the first high point toward Valle di Teva, I soon would encounter some serious problems. After taking off the road toward Macerata Feltria, the road turned much worse and it would take me two hours to reach the village only a few kilometres away (in retrospect I could have walked and carried the bicycle on my shoulder and get much quicker to the village). First there were a descent with over 20% and then there was a thick layer of wet dirt and stones on the road surface that glued to my poor tyres (I should have gotten new tyres before leaving as mine were filled of small cuts). I had a flat as certain as if I had stabbed a sharp knife into the tyres. Just to stop and fix the flat again. Trying to clean up the dirty wheel with grass so I could even see the tyre and then carefully mended the tyre. It took some time getting air into the tyre. If I remember correctly it did not work at once. Eventually I got going, but was not sure of the road to take, but took the right one first, which soon came to a stretch with only stony gravel on it and soon thereafter I took a wrong turn as a sign said the road in the other direction was closed. Then only two hundred metres later I had a new flat in my other tyre! I guess patience was going quickly away now. I took an even longer time carefully mending this flat also with my next to last patch I have as extra security with me. First the patch did not want to stay and I was about to use the last patch, but then decided to try what usually does not work and reused the failed patch and this time I eventually got it to hold under pressure. The road soon ended and I asked a girl by a house of the right road to Macerata Feltria and apparently the closed road was not really closed (things are not always like they tell you in Italy!). Here was another little climb and I could see the gray and cloudy skies in the distance toward Monte Nerone and that surely did not look inviting. Now it was already 16:00 pm when I reached the village and it was cold even down here. I was not in a good mood. I stopped for a coffee and decided to give up on Monte Nerone. No point climbing it in the dark with clouds and possible rain. Sometimes one just have to give up, but it was a sour decision to make, even if obviously correct. It would have been totally insane to try and get up there this late as I might not have gotten to the start of the climb before the dark even, being quite some distance away and then having as long way back to Rimini, I would not had been back before the next morning when we were to leave. 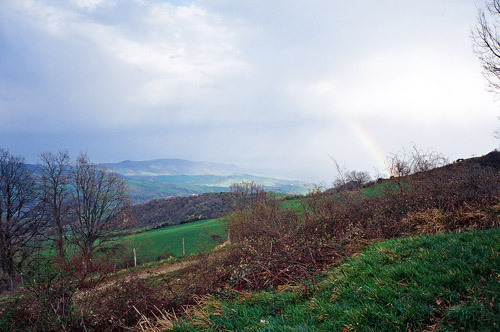 It was a cold, but a somewhat nice, journey back to Rimini via Monte Cerignone where I took the last photo of a rainbow. 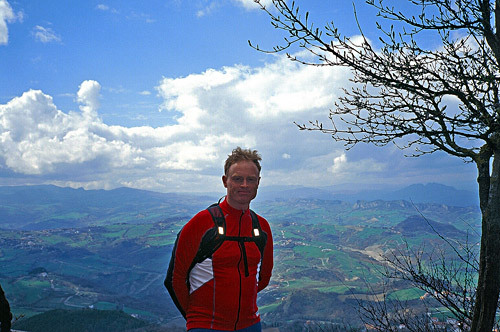 I climbed over Montescudo back to Rimini, that I reached just before dark. Apart from Monte Nerone I had accomplished all my main goals for the trip to Rimini, so I was anyway fairly happy with the visit overall. 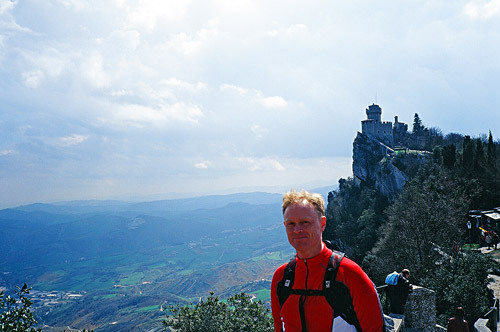 Quite a lot of nice views and exciting climbs down here! 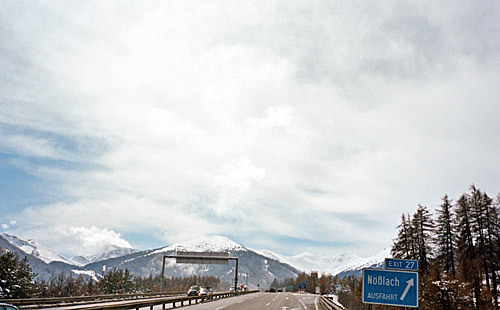 The last photo was my first photo from when we crossed into Italy over the Brennerpass.